Learn about an approach to collect events from devices in your organization. This article talks about events in both normal operations and when an intrusion is suspected. Windows Event Forwarding (WEF) reads any operational or administrative event log on a device in your organization and forwards the events you choose to a Windows Event Collector (WEC) server. To accomplish this, there are two different of subscriptions published to client devices - the Baseline subscription and the suspect subscription. The Baseline subscription enrolls all devices in your organization, and a Suspect subscription only includes devices that have been added by you. The Suspect subscription collects additional events to help build context for system activity and can quickly be updated to accommodate new events and/or scenarios as needed without impacting baseline operations. This implementation helps differentiate where events are ultimately stored. Baseline events can be sent to devices with online analytical capability, such as Security Event Manager (SEM), while also sending events to a MapReduce system, such as HDInsight or Hadoop, for long-term storage and deeper analysis. Events from the Suspect subscription are sent directly to a MapReduce system due to volume and lower signal/noise ratio, they are largely used for host forensic analysis. An SEM’s strength lies in being able to inspect, correlate events, and generate alerts for known patterns manner and alert security staff at machine speed. A MapReduce system has a longer retention time (years versus months for an SEM), larger ingress ability (hundreds of terabytes per day), and the ability to perform more complex operations on the data like statistical and trend analysis, pattern clustering analysis, or apply Machine Learning algorithms. Event generation on a device must be enabled either separately or as part of the GPO for the baseline WEF implementation, including enabling of disabled event logs and setting channel permissions. For more info, see Appendix C - Event channel settings (enable and channel access) methods. This is because WEF is a passive system with regards to the event log. It cannot change the size of event log files, enable disabled event channels, change channel permissions, or adjust a security audit policy. WEF only queries event channels for existing events. Additionally, having event generation already occurring on a device allows for more complete event collection building a complete history of system activity. Otherwise, you'll be limited to the speed of GPO and WEF subscription refresh cycles to make changes to what is being generated on the device. On modern devices, enabling additional event channels and expanding the size of event log files has not resulted in noticeable performance differences. For the minimum recommended audit policy and registry system ACL settings, see Appendix A - Minimum recommended minimum audit policy and Appendix B - Recommended minimum registry system ACL policy. Note: These are only minimum values need to meet what the WEF subscription selects. From a WEF subscription management perspective, the event queries provided should be used in two separate subscriptions for ease of maintenance; only machines meeting specific criteria would be allowed access to the targeted subscription, this access would be determined by an algorithm or an analysts’ direction. All devices should have access to the Baseline subscription. Baseline WEF subscription. Events collected from all hosts, this includes some role-specific events, which will only be emitted by those machines. Targeted WEF subscription. Events collected from a limited set of hosts due to unusual activity and/or heightened awareness for those systems. Each using the respective event query below. Note that for the Targeted subscription enabling the “read existing events” option should be set to true to allow collection of existing events from systems. By default, WEF subscriptions will only forward events generated after the WEF subscription was received by the client. In Appendix E – Annotated Baseline Subscription Event Query and Appendix F – Annotated Suspect Subscription Event Query, the event query XML is included when creating WEF subscriptions. These are annotated for query purpose and clarity. Individual <Query> element can be removed or edited without affecting the rest of the query. This section addresses common questions from IT pros and customers. Will the user notice if their machine is enabled for WEF or if WEF encounters an error? The longer answer is: The Eventlog-forwardingPlugin/Operational event channel logs the success, warning, and error events related to WEF subscriptions present on the device. Unless the user opens Event Viewer and navigates to that channel, they will not notice WEF either through resource consumption or Graphical User Interface pop-ups. Even if there is an issue with the WEF subscription, there is no user interaction or performance degradation. All success, warning, and failure events are logged to this operational event channel. Is WEF Push or Pull? A WEF subscription can be configured to be push or pull, but not both. The simplest, most flexible IT deployment with the greatest scalability can be achieved by using a push, or source initiated, subscription. WEF clients are configured by using a GPO and the built-in forwarding client is activated. For pull, collector initiated, the subscription on the WEC server is pre-configured with the names of the WEF Client devices from which events are to be selected. Those clients also have to be configured ahead of time to allow the credentials used in the subscription to access their event logs remotely (normally by adding the credential to the Event Log Readers built-in local security group.) A useful scenario: closely monitoring a specific set of machines. Will WEF work over VPN or RAS? WEF handles VPN, RAS, and DirectAccess scenarios well and will reconnect and send any accumulated backlog of events when the connection to the WEF Collector is re-established. How is client progress tracked? The WEC server maintains in its registry the bookmark information and last heartbeat time for each event source for each WEF subscription. When an event source re-connects to a WEC server, the last bookmark position is sent to the device to use as a starting point to resume forwarding events. If a WEF client has no events to send, the WEF client will connect periodically to send a Heartbeat to the WEC server to indicate it is active. This heartbeat value can be individually configured for each subscription. Will WEF work in an IPv4, IPv6, or mixed IPv4/IPv6 environment? Yes. WEF is transport agnostic and will work over IPv4 or IPv6. Are WEF events encrypted? I see an HTTP/HTTPS option! In a domain setting, the connection used to transmit WEF events is encrypted using Kerberos, by default (with NTLM as a fallback option, which can be disabled by using a GPO). Only the WEF collector can decrypt the connection. Additionally, the connection between WEF client and WEC server is mutually authenticated regardless of authentication type (Kerberos or NTLM.) There are GPO options to force Authentication to use Kerberos Only. This authentication and encryption is performed regardless if HTTP or HTTPS is selected. The HTTPS option is available if certificate based authentication is used, in cases where the Kerberos based mutual authentication is not an option. The SSL certificate and provisioned client certificates are used to provide mutual authentication. Do WEF Clients have a separate buffer for events? The WEF client machines local event log is the buffer for WEF for when the connection to the WEC server is lost. To increase the “buffer size”, increase the maximum file size of the specific event log file where events are being selected. For more info, see Appendix C – Event Channel Settings (enable and Channel Access) methods. When the event log overwrites existing events (resulting in data loss if the device is not connected to the Event Collector), there is no notification sent to the WEF collector that events are lost from the client. Neither is there an indicator that there was a gap encountered in the event stream. What format is used for forwarded events? WEF has two modes for forwarded events. The default is “Rendered Text” which includes the textual description of the event as you would see it in Event Viewer. This means that the event size is effectively doubled or tripled depending on the size of the rendered description. The alternative mode is “Events” (also sometimes referred to as “Binary” format) – which is just the event XML itself sent in binary XML format (as it would be written to the evtx file.) This is very compact and can more than double the event volume a single WEC server can accommodate. How frequently are WEF events delivered? Event delivery options are part of the WEF subscription configuration parameters – There are three built-in subscription delivery options: Normal, Minimize Bandwidth, and Minimize Latency. A fourth, catch-all called “Custom” is available but cannot be selected or configured through the WEF UI by using Event Viewer. The Custom delivery option must be selected and configured using the WECUTIL.EXE command-line application. All subscription options define a maximum event count and maximum event age, if either limit is exceeded then the accumulated events are sent to the event collector. Normal This option ensures reliable delivery of events and does not attempt to conserve bandwidth. It is the appropriate choice unless you need tighter control over bandwidth usage or need forwarded events delivered as quickly as possible. It uses pull delivery mode, batches 5 items at a time and sets a batch timeout of 15 minutes. Minimize bandwidth This option ensures that the use of network bandwidth for event delivery is strictly controlled. It is an appropriate choice if you want to limit the frequency of network connections made to deliver events. It uses push delivery mode and sets a batch timeout of 6 hours. In addition, it uses a heartbeat interval of 6 hours. For more info about delivery options, see Configure Advanced Subscription Settings. How do I control which devices have access to a WEF Subscription? For source initiated subscriptions: Each WEF subscription on a WEC server has its own ACL for machine accounts or security groups containing machine accounts (not user accounts) that are explicitly allowed to participate in that subscription or are explicitly denied access. This ACL applies to only a single WEF subscription (since there can be multiple WEF subscriptions on a given WEC server), other WEF Subscriptions have their own separate ACL. For collector initiated subscriptions: The subscription contains the list of machines from which the WEC server is to collect events. This list is managed at the WEC server, and the credentials used for the subscription must have access to read event logs from the WEF Clients – the credentials can be either the machine account or a domain account. Can a client communicate to multiple WEF Event Collectors? Yes. If you desire a High-Availability environment, simply configure multiple WEC servers with the same subscription configuration and publish both WEC Server URIs to WEF clients. WEF Clients will forward events simultaneously to the configured subscriptions on the WEC servers, if they have the appropriate access. What are the WEC server’s limitations? There are three factors that limit the scalability of WEC servers. The general rule for a stable WEC server on commodity hardware is “10k x 10k” – meaning, no more than 10,000 concurrently active WEF Clients per WEC server and no more than 10,000 events/second average event volume. Disk I/O. The WEC server does not process or validate the received event, but rather buffers the received event and then logs it to a local event log file (EVTX file). The speed of logging to the EVTX file is limited by the disk write speed. Isolating the EVTX file to its own array or using high speed disks can increase the number of events per second that a single WEC server can receive. Network Connections. While a WEF source does not maintain a permanent, persistent connection to the WEC server, it does not immediately disconnect after sending its events. This means that the number of WEF sources that can simultaneously connect to the WEC server is limited to the open TCP ports available on the WEC server. Registry size. For each unique device that connects to a WEF subscription, there is a registry key (corresponding to the FQDN of the WEF Client) created to store bookmark and source heartbeat information. If this is not pruned to remove inactive clients this set of registry keys can grow to an unmanageable size over time. When a subscription has >1000 WEF sources connect to it over its operational lifetime, also known as lifetime WEF sources, Event Viewer can become unresponsive for a few minutes when selecting the Subscriptions node in the left-navigation, but will function normally afterwards. At >50,000 lifetime WEF sources, Event Viewer is no longer an option and wecutil.exe (included with Windows) must be used to configure and manage subscriptions. At >100,000 lifetime WEF sources, the registry will not be readable and the WEC server will likely have to be rebuilt. 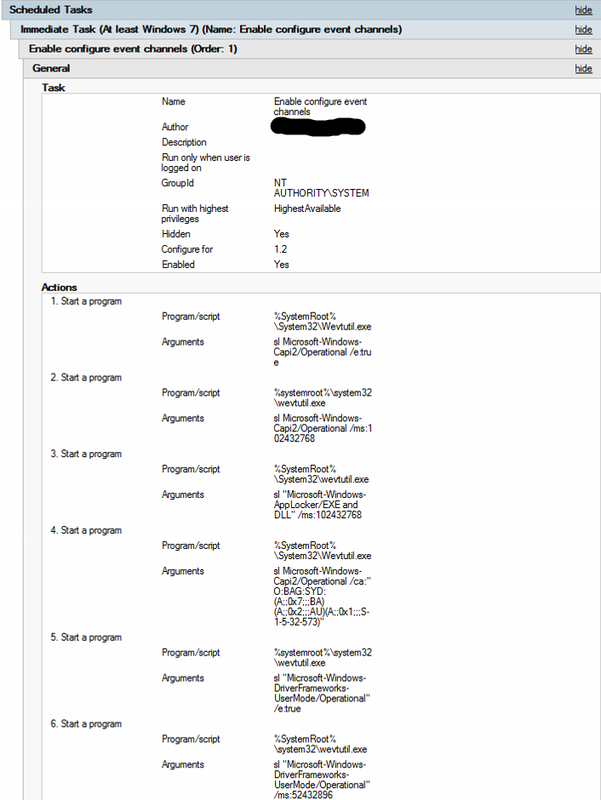 Below lists all of the items that each subscription collects, the actual subscription XML is available in an Appendix. These are separated out into Baseline and Targeted. The intent is to subscribe all hosts to Baseline, and then enroll (and remove) hosts on an as needed basis to the Targeted subscription. While this appears to be the largest subscription, it really is the lowest volume on a per-device basis. (Exceptions should be allowed for unusual devices – a device performing complex developer related tasks can be expected to create an unusually high volume of process create and AppLocker events.) This subscription does not require special configuration on client devices to enable event channels or modify channel permissions. The subscription is essentially a collection of query statements applied to the Event Log. This means that it is modular in nature and a given query statement can be removed or changed without impacting other query statement in the subscription. Additionally, suppress statements which filter out specific events, only apply within that query statement and are not to the entire subscription. To gain the most value out of the baseline subscription we recommend to have the following requirements set on the device to ensure that the clients are already generating the required events to be forwarded off the system. Apply a security audit policy that is a super-set of the recommended minimum audit policy. For more info, see Appendix A – Minimum Recommended minimum Audit Policy. 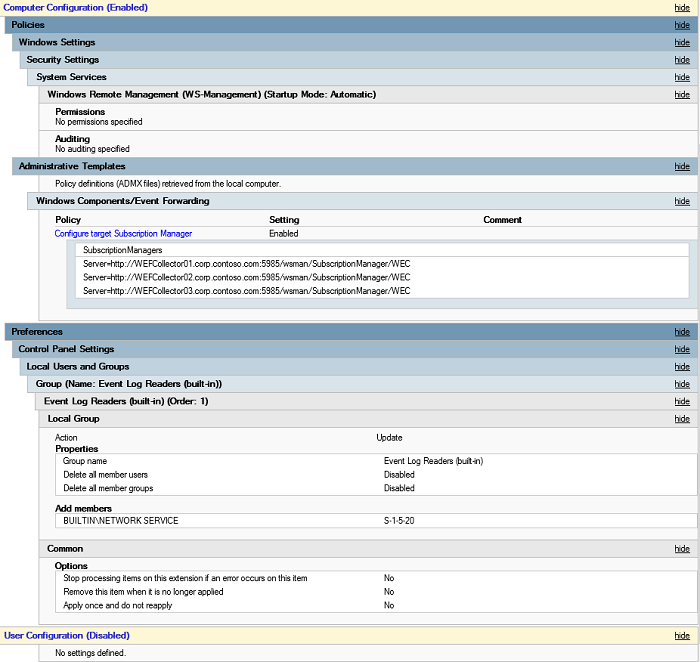 This ensures that the security event log is generating the required events. Apply at least an Audit-Only AppLocker policy to devices. If you are already whitelisting or blacklisting events by using AppLocker, then this requirement is met. AppLocker events contain extremely useful information, such as file hash and digital signature information for executables and scripts. Enable disabled event channels and set the minimum size for modern event files. Currently, there is no GPO template for enabling or setting the maximum size for the modern event files. This must be done by using a GPO. For more info, see Appendix C – Event Channel Settings (enable and Channel Access) methods. The annotated event query can be found in the following. For more info, see Appendix F – Annotated Suspect Subscription Event Query. Anti-malware events from Microsoft Antimalware or Windows Defender. This can be configured for any given anti-malware product easily if it writes to the Windows event log. Security event log Process Create events. AppLocker Process Create events (EXE, script, packaged App installation and execution). Registry modification events. For more info, see Appendix B – Recommended minimum Registry System ACL Policy. Startup event include operating system version, service pack level, QFE version, and boot mode. Includes what the name of the service, the image path, and who installed the service. This is only applicable on systems with the Certificate Authority role installed. Logs certificate requests and responses. Use of a temporary profile or unable to create a user profile may indicate an intruder is interactively logging into a device but not wanting to leave a persistent profile behind. Failure codes are localized, so you have to check the message DLL for values. Filter out IPC$ and /NetLogon file shares, which are expected and noisy. Find out what initiated the restart of a device. Remote Desktop Services session connect, reconnect, or disconnect. EMET events, if EMET is installed. For monitoring WEF subscription operations, particularly Partial Success events. This is useful for diagnosing deployment issues. Enables detection of unauthorized share creation. >Note: All shares are re-created when the device starts. Logon success for services for non-built-in accounts, such as LocalSystem, LocalNetwork, and so on. Logon session close, which are logoff events for non-network sessions. This can help detect early signs of intruder not familiar with enterprise environment using targeted malware. Errors, start events, and stop events for the Windows Event Log service. This could indicate an intruder that are covering their tracks. This indicates that at the time of logon a user is either an Administrator or has the sufficient access to make themselves Administrator. A user was added or removed from the local Administrators security group. Associated with signing objects using the locally stored private key. Task Scheduler allows intruders to run code at specified times as LocalSystem. Detect credential use changes by intruders to access additional resources. This detects when a smartcard is being used. This adds some possible intruder-related activity to help analyst further refine their determinations about the state of the device. Enables time-series analysis of network graphs. Useful if you use a Microsoft IAS RADIUS/VPN implementation. It shows user-> IP address assignment with remote IP address connecting to the enterprise. Excludes well known, built-in system accounts. Specific for network logon sessions. Returns what process performed a DNS query and the results returned from the DNS server. Enables checking for processes terminating unexpectedly. Generated when the local SAM is authoritative for the account credentials being authenticated. On client devices this is only generated when local accounts log on. Only when a registry value is being created, modified, or deleted. Covers Windows PowerShell 2.0 and later and includes the Windows PowerShell 5.0 logging improvements for in-memory attacks using Windows PowerShell. Can possibly detect a USB device loading multiple device drivers. For example, a USB_STOR device loading the keyboard or network driver. If your organizational audit policy enables additional auditing to meet its needs, that is fine. The policy below is the minimum audit policy settings needed to enable events collected by both baseline and targeted subscriptions. The Run and RunOnce keys are useful for intruders and malware persistence. It allows code to be run (or run only once then removed, respectively) when a user logs into the system. This can easily be extended to other Auto-Execution Start Points keys in the registry. Use the following figures to see how you can configure those registry keys. Some channels are disabled by default and have to be enabled. Others, such as Microsoft-Windows-CAPI2/Operational must have the channel access modified to allow the Event Log Readers built-in security group to read from it. The recommended and most effective way to do this is to configure the baseline GPO to run a scheduled task to configure the event channels (enable, set maximum size, and adjust channel access.) This will take effect at the next GPO refresh cycle and has minimal impact on the client device. Enables the Microsoft-Windows-Capi2/Operational event channel. Sets the maximum file size for Microsoft-Windows-Capi2/Operational to 100MB. Sets the maximum file size for Microsoft-Windows-AppLocker/EXE and DLL to 100MB. Sets the maximum channel access for Microsoft-Windows-Capi2/Operational to include the built-in Event Log Readers security group. Enables the Microsoft-Windows-DriverFrameworks-UserMode/Operational event channel. Sets the maximum file size for Microsoft-Windows-DriverFrameworks-UserMode/Operational to 50MB. Add the Network Service account to the built-in Event Log Readers security group. This allows reading from secured event channel, such as the security event channel.